When you're trying to get navigate your bass from here to there, dangers can literally lurk around every corner. 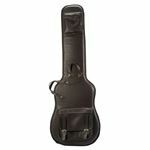 Protect your instrument with a Bass Guitar Bag. Lightweight, portable, and convenient, a gig bag is the perfect travelling companion for you and your bass.